We’re now 6 weeks into the Organize & Refine Your Home Challenge. Bravo to you for sticking to your commitment to complete the Challenge assignments! Last week, we dove head first into our “take back the home office” month by setting up a system for managing tax documents. This week we are turning our attention to reference file organization. If you’ve already completed the Paper Declutter Challenge, then you my Friend are going to reap the rewards of your hard work, since this week’s challenge assignment is basically the same as Week 3 of the paper declutter challenge. For the rest of you, get ready to start sorting and purging! We are going to dig into the place in your home office area that houses your long-term reference papers. If your reference papers happen to live somewhere else in your home other than a home office (room or area of your home), go ahead and take this opportunity to complete this week’s assignment to purge and organize these files. Whether your reference files live in a traditional file cabinet, a portable file box, or a cardboard box, I’m willing to bet that they could benefit from a good ol’ fashioned decluttering session. Am I right? 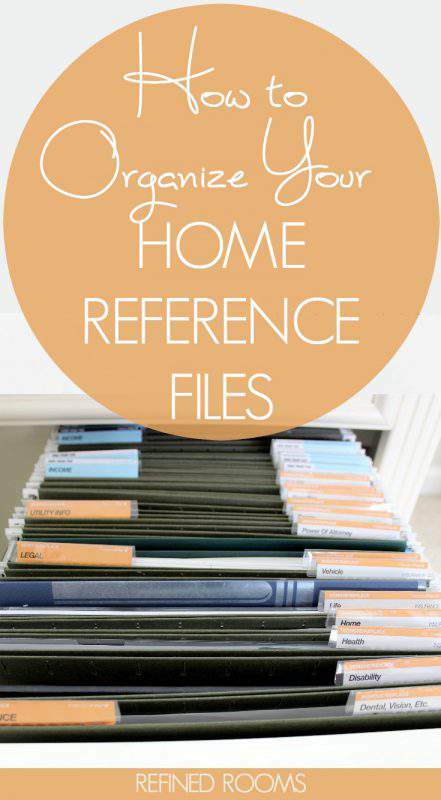 I walk you through a detailed process for organizing reference files here. In the meantime, here’s a brief synopsis of what this week is all about. In addition to simply decluttering your files, your mission this week is to take a good hard look at your file structure (i.e., the categories you are using to organize the files) to see if some tweaking might be in order. How much tweaking you’ll need to do will depend on the last time you went through your files. If t’s been more than a couple of years, you might just find that it’s time to start from scratch. Next, you’ll need to establish a household “document retention schedule”…how long do you need to hang on to each type of document in your file system? Once you have a file structure, and a set of rules for how long you need to keep things, it makes the paper sorting/purging process much easier, since you’ve already made the hard decisions up front. For the papers you decide to purge, you’ll need to determine what can safely be recycled and what should be shredded. I’ve put together a printable What You Need To Shred Guide to help you through that process. Then comes the fun part…putting Humpty Dumpty back together again! File away only those papers that have been sorted into the KEEP pile into their proper file home. Most of our household reference papers are scanned and kept in electronic format. 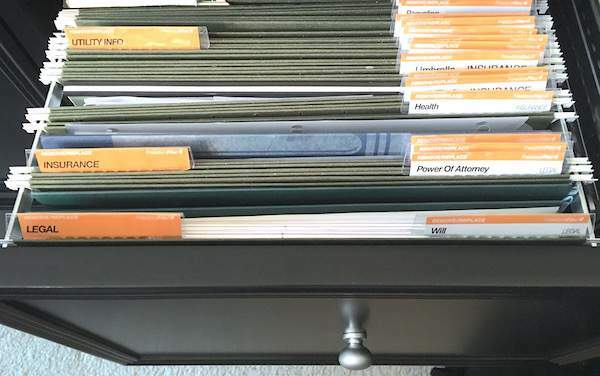 For the small portion of paper reference files that we do keep (insurance papers, original legal documents, some vital documents and incoming tax documents), I use the Freedom Filer system to organize them. Check out this post to learn all the reasons why Freedom Filer rocks. The last piece of the file organization puzzle is to create a maintenance plan, so don’t forget that crucial step. Once you’ve completed your assignment, share a photo of your organized files on Instagram (use the hashtag #OrganizeandRefineChallenge and don’t forget to follow me) so that we can all give you a High Five for getting those file drawers organized this week! Your advice to separate your papers by when you need to use them is wonderful. I feel like I’m always losing the paperwork that I need to fill out because it ends up in the back of the drawer or on top of the filing cabinet. Keeping my reference papers in a filing system and my “action papers” on the desktop will really help my home office stay organized.